Nii Adjeiter Mattor III, Tema Ashamang Chief Fisherman, has been fingered to be part of a syndicate involved in the siphoning and smuggling of premix fuel. Mrs Elizabeth Afoley Quaye, Minister of Fisheries and Aquaculture, told the media on Friday that Nii Mator claimed ownership of two drums of suspected premix fuel which was impounded by the TemaMarine, Railway and Port police. Mrs Quaye explained that the Police on February 15, 2018 at about 18:30 hoursintercepted an Opel caravan with registration number GT 420 W loaded with two drums of suspected premix fuel at the canoe beach and instructed the driver to convey them to his workers at Senya in the Central Region. 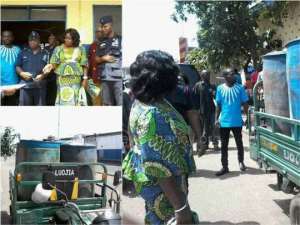 She disclosed that the Police had intercepted 10 drums of suspected siphoned premix fuel within the past one week. Three drums were impounded on February 16 at about 15:20 hours in an Opel caravan taxi with registration number GR 1175-W being driven by one Anthony Offoo. One Emmanuel Larbi Mensah, the Minister noted, claimed ownership of the three drums which he said he paid GHC 1,520 for through his friend Kwesi to be bought from Tema Fishing Harbour and transported to him at Apam. The remaining five drums, she announced, were intercepted on February 22, loaded on a motor cycle be ridden by Patrick Fianu who is currently in custody. The Fisheries Minister said premix fuel was available in all landing beaches in the country therefore nobody should transport it from one town to the other. She urged fisher-folks who needed premix fuel to contact the regional premix monitoring body in their respective areas to order as the body which is headed by the various Regional Ministers which liaised with the National Premix Secretary for its provision. According to her, because trucks of premix fuel were now being monitored, people could not divert it and therefore siphon it from the landing beaches at dawn and smuggle it to other regions. MrsQuaye commended the Police and the liaison officer for Premix fuel at the Tema Oil Refinery for ensuring that the government's quest to fight corruption and rot in the system. Meanwhile, NiiMattor has denied ownership of the premix fuel explaining that he went to the police station due to his position as a chief fisherman. 'Because I am a chief fisherman, every fisherman is my son, that was the reason why I went to the police station, but the fuel is not mine. Over one year now, I have never handled even one gallon of premix fuel,' he said.